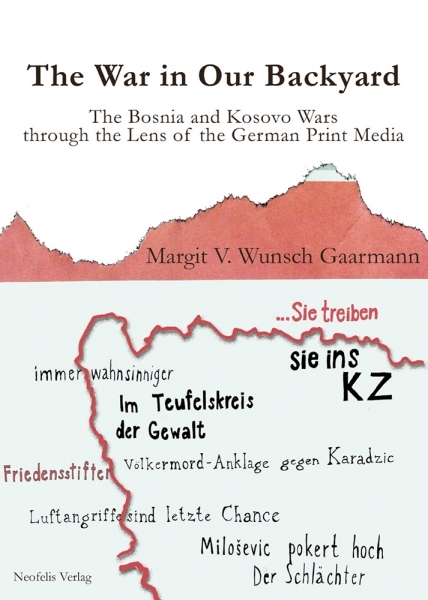 The War in Our Backyard is a novel study of the German press’ textual and visual coverage of the wars in Bosnia (1992–1995) and Kosovo (1998–1999). Key moments from both wars have been selected and analysed using a broad range of publications reaching from far-right to far-left and including broadsheets, a tabloid and a news magazine. Two sections with parallel chapters form the core of the book: the first part dealing with the war in Bosnia and the second with Kosovo. Each section contains one chapter on the initial phase of the conflict, one chapter on an important atrocity – namely the Srebrenica Massacre in Bosnia and the Račak incident in Kosovo – and, lastly, a chapter each on the international involvement which ended the immediate violence. The book examines how the various events were covered, what sources were used and what insights these examples of the German press conveyed. Special attention has been paid to four key themes, which emerged from the research. Firstly, the changing perceptions of the Serbian President Slobodan Miloševic and the issue of who was to blame for the conflicts; secondly, how various armed forces, including the Yugoslav Peoples’ Army and the Kosovo Liberation Army were presented in the German press; thirdly, the persistent presence of the Second World War and the Holocaust in the coverage of the wars in Bosnia and Kosovo and how they shaped the press’ interpretation of the violence; and lastly, how Germany’s role in the Balkans – both in the realms of diplomacy and military intervention – was evaluated by the national press. Pictures and cartoons accompanying the textual coverage have been included to present a more rounded picture of press coverage.